If Edward Abbey was God, Jim Stiles would be Jeremiah, the Weeping Prophet of our time. Jim is the Messianic-like prophet of the West revealing the sins of both industrialist and environmentalist alike. Though he is cut from the same cloth as environmentalists and fought with them against destructive extractive industries and irresponsible ranching practices, he soon turned his attention on their hypocrisy and what he saw as their equally egregious silence in the face of a destructive recreation based economy sweeping the West; the very industry they promote on the back end that contributes to the expansion of the extractive industries they are fighting on the front end. I stumbled upon Jim in 2011 while finishing a graduate degree in Environmental Policy & Management. I was intrigued by his message when I saw a trailer for a documentary about him, but it was his book that really got my attention. Brave New West was funny, insightful, and depressing to the point of almost pushing me over the edge of apathy. It was also refreshing. Environmentalism is a response to a problem accompanied by frustration and disappointment: with each presumed “fix” there comes another problem. Jim shows that the problems inherent in addressing environmental degradation are more complicated and insidious than we ever thought. He believes that environmentalists have gone full circle in their battle to protect the environment and are now damaging the environment themselves, suggesting that their answer, a recreation based economy, has gone too far. He reveals that the good they are doing on the one hand is being undermined by damaging activities they promote on the other. His message is a cautionary one: those pushing the environmental agenda must ensure they are not equally damaging the environment through their answer to an extractive economy. This blind spot by environmental organizations and outdoor enthusiasts is the nucleus of Jim’s argument. I started an email dialogue with Jim shortly after reading his book and hoped to one day publish an article in his Moab-based rag The Canyon Country Zephyr. That day appeared during the government shutdown when I found an issue to write about that I thought might be acceptable to Jim, a piece on Utah’s obsession with taking back public lands that warned of the short-sighted answer Utah politicians were peddling in response to the government shutdown and subsequent economic losses that crippled the state when public lands and National Parks closed. While I knew where Jim stood on the dangers of a recreation based economy, I thought I could address the value of the land through more passive uses such as hiking, biking, and camping and the joy such activities provide, contrasting it with how more drilling and digging in the name of short economic gains never could. In other words, I was suggesting that the land has more value than just want can be found there monetarily. Jim sent me a link to an article (1) he had written about the Moab Lions Park Transit Hub and Elevated River Bikeway. 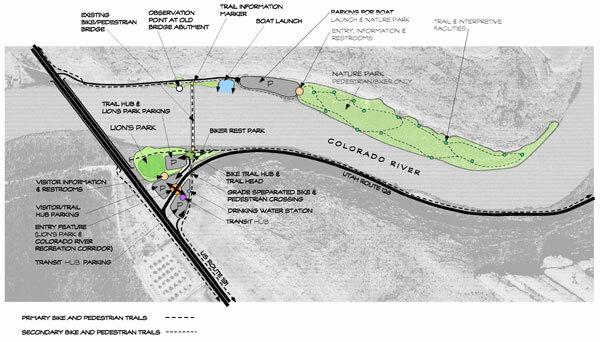 What I discovered was a $9.2 million, Disneyland-like bike path, proposed to be built in Moab that would take engineering genius equal to that necessary for dams, roads, and pipelines. Because the path runs along the Colorado River, and would have major impacts on the environment, the Bureau of Land Management had to do an Environmental Impact Statement (EIS) on it. In the three years that this was being done, and the EIS was open for comments, not one environmental group made a comment. In his article Jim revealed how vocal environmental groups were hypocritically silent on this gargantuan project that would have severe impacts on the environment, pointing out that Moab’s turn toward a recreation based economy, building ever more extensive recreational options for tourists in response to a sagging economy, was becoming an environmental nightmare. He expressed concern that my article was just another argument in favor of a recreation based economy, like the one in Moab, and that it did not address this double standard. In his book he had written about how environmental groups had brought about the recreation based economy in response to the economic vacuum left from the extractive industry, but then stood silently by when their baby turned into an uncontrollable monster doing its own damage to the environment. He said he would publish my piece but that he would have to write a rebuttal in response. Though a 9 million dollar monstrosity of a bike path was not what I envisioned in my piece, I welcomed the rebuttal and sought a dialogue with Jim on the issue of recreation. I asked Jim what the answer to impacting the natural world was, recreation or otherwise, as we all impact it one way or another. I could see his point on the bike path. It was ridiculous to the point of absurdity that environmental groups had not fought it with the zeal they would fight new roads impacting wilderness and riparian areas. I wanted to know where he drew the line; if his beef was with the activities, such as biking, or with taking the activities too far, such as the elevated bikeway. In other words, is all recreation bad, or are there degrees that are preferable to others? I asked him if he thought we should ban mountain biking, climbing, and hiking altogether and asked if his answer was locking wilderness away from everyone; in other words, was he proposing an all or nothing solution. Playing devil’s advocate, I suggested that perhaps environmentalists are just fighting the value war, that since it’s all about the bottom line, they are making the case that recreation provides economic benefits equal to the extractive industry – perhaps even more than the extractive industry. Furthermore, would it worsen their plight of looking like the ones trying to hurt the economy by adding recreation to their list of environmental ills? By fighting recreation and tourism, would they give those opposing them extra fodder to label them as being opposed to everything, offering no solution short of a return to an extreme, draconian, subsistence life? I agreed with him on the absurdity of supporting industrialized recreation, but asked if he would concede that the more passive form of recreation, that which exists without engineering and construction, is a preferable option to a nuclear power plant, or uranium mining. Since my article was referring to low impact recreation and was only addressing the State’s attempt to take back public lands, I tried to explain that it was not the same as pushing for the industrial recreation machine ravaging the West. Since Jim intended to write a rebuttal to my article, I asked if he would be interested in punting back and forth on these issues. I figured he could just say no if he wasn’t interested. What I got after pressing Jim on his stance regarding recreational tourism was a tired dismissal of my arguments questioning if I was familiar with The Zephyr and his book, and how I was too late to a game he has been in for 25 years. He asked where I had been 10 years ago. In truth, 10 years ago I was an anti-environmentalist who had never heard of Jim Stiles. I had only discovered him a few short years ago and his response stung. Had I been like a greenhorn landlubber arguing with a crusty, seasoned sea captain about navigating the perilous seas? His chastisement was a humbling lesson that left me feeling defensive, especially since I had thought we were kindred spirits who saw things through a similar skeptic’s eye. Pondering Jim’s statement that I was like someone who has walked into a ball game during the seventh inning and says, “Let’s play ball,” I went back and re-read my emails, the suggested articles he sent me, and pulled out my copy of Brave New West and went over all the highlighted sections. I found myself nodding and smiling at the insights of his book all over again and as I did, my anger cooled. I still admired him and concluded that we had misunderstood each other through poor communication. Though I could see why people who once embraced Jim as a fellow environmental fighter distanced themselves when his critical eye turned on them, I also recognized where our misunderstanding came from and began to see why so many get Jim wrong. Solutions often hide future problems. It was not the solution that Jim was lacking, but the ability to adequately explain it. Instead of backing environmentalists into a lose-lose position, he could have shown how turning recreation into an industrial machine to fuel the economy is equally as bad as taking industrial and technological progress too far in the name of the economy. The solution? As with all environmental problems, there is no simple or easy answer. Jim’s answer to environmentalists is to be consistent, suggesting that any project that hurts the environment should get their attention, action, and possibly condemnation. Beyond that, his solution is inherently an individual one where each person must look inward at their own lives and decisions as much as at the outward impacts of others. 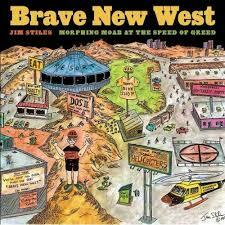 In his book, Jim talked about the differences between the Old West and the New West and describes how each side caricaturizes the other and how they both get some things right and some wrong and that an acknowledgment of our own hypocrisy is the start to a humble approach to each other and to the future of the West. In that, he is right. His problem, however, is that he does not differentiate between low impact and high impact recreation; and therefore, those listening to Jim could rightfully say that pointing out a problem, minus a solution, is just a complaint. Because he does not offer a middle ground, or a realistic and reasonable answer, he is evading a glaring blind spot in his own argument and appears to be preaching or grinding an issue to no end. In hindsight, I see that Jim was asking me to see the bigger picture, and that he may have missed that I was asking him for a reasonable solution, or middle ground, to what appeared to be an all or nothing argument. Perhaps someday we will find that common ground. In the meantime, his point is still a compelling one that may be lost on those not willing to go the distance to understand it and the industrial recreation and tourism machine will continue to blaze a path through the fragile West. The West is wrought with big ideas and even bigger consequences and it takes big personalities to make them happen. I don’t think Jim is a big personality, but I do believe he is a strong and integral one and that his lone voice in the wilderness should be listened to because it adds to the ideas and voices shaping the West. He exemplifies the rugged and hard individual the west is so famous for and I am certain none of them were easy to get along with. In the end, it may be Jim contra mundum, Jim against the world, but I hope not. A west without discordant voices is no west at all. If we are to hang on to the west as we all know it, both past and present, and in legend and lore, we must also hang on to the hardscrabble people willing to fight for it, even if they are difficult and hard to handle because much like the Age of Extractive Industries before it, the Age of Industrial Recreation and Tourism has ironically similar and far reaching implications for the West. Posted on March 2, 2014, in Nature and the Environment and tagged industrial recreation, industrial tourism, Jim Stiles, Moab, moab transit hub, the west. Bookmark the permalink. Leave a comment.